This new inexpensive 3D printer can produce flat plastic items that, when heated, fold themselves into predetermined shapes such as a rose, a boat or even a bunny. 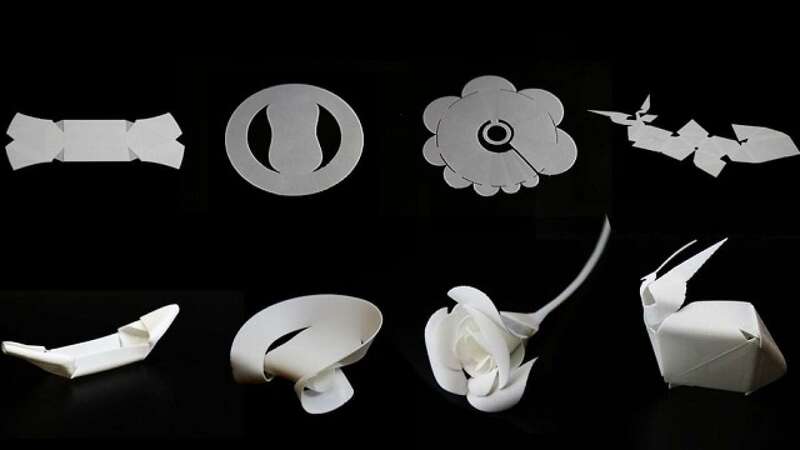 These self-folding plastic objects represent the first step towards products such as flat-pack furniture that assume their final shapes with the help of a heat gun, said researchers from Carnegie Mellon University in the US. Emergency shelters also might be shipped flat and fold into shape under the warmth of the sun. "The software is based on new curve-folding theory representing banding motions of the curved area," said Byoungkwon An, a research affiliate at Carnegie Mellon University. "The software based on this theory can compile any arbitrary 3-D mesh shape to an associated thermoplastic sheet in a few seconds without human intervention," said An. Self-folding materials are quicker and cheaper to produce than solid 3D objects, making it possible to replace noncritical parts or produce prototypes using structures that approximate the solid objects. Molds for boat hulls and other fiberglass products might be inexpensively produced using these materials. The researchers were able to create self-folding structure by using the least expensive type of 3D printer - an FDM printer - and by taking advantage of warpage, a common problem with these printers. "We wanted to see how self-assembly could be made more democratic - accessible to many users," said Lining Yao, assistant professor at Carnegie Mellon University. FDM printers work by laying down a continuous filament of melted thermoplastic. These materials contain residual stress and, as the material cools and the stress is relieved, the thermoplastic tends to contract. This can result in warped edges and surfaces. To create self-folding objects, researchers precisely control this process by varying the speed at which thermoplastic material is deposited and by combining warp-prone materials with rubber-like materials that resist contracture. The objects emerge from the 3D printer as flat, hard plastic, researchers said. When the plastic is placed in water hot enough to turn it soft and rubbery - but not hot enough to melt it - the folding process is triggered.